Grab your mask and fins and come on down to Portland for the weekend and log some of your first UK dives! 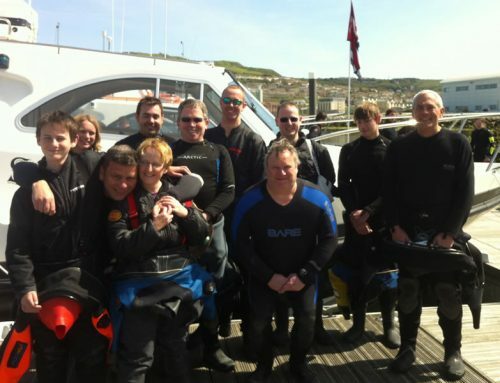 This is a specially constructed weekend for those who want to dip their toe in UK waters for the first time, gain some UK experience or maybe take a nice easy shallow dive for the first dive of the season. Test out your kit, check your buoyancy and wash away those winter cobwebs! The trips are designed to help you find your fins and gain confidence. They are NOT training weekends and no teaching or dive guide work will take place on the trip. We will look after you and help you though. This is your chance to ask questions, learn boat etiquette, try new kit etc. No question is too silly and no request for help or advice will be scowled upon. The trips were put together in response to newly qualified divers struggling to get on to trips with little or no experience. People learning to dive abroad often struggle to get onto a boat in the UK with little or no experience, as do newly qualified UK divers. Many clubs want you to have experience before booking on their trips. The Intro to UK diving trips are designed to bridge this gap. So long as you have completed your Open Water course, BSAC Ocean Diver or equivalent, you can come on this trip. The maximum depth on this trip will be 18m. We are diving off a RIB which is much faster than a hard boat and provides more flexibility between dive sites. We come back to shore between dives, so you only need to bring one tank with you. We aim to dive the Black Hawk, a shallow wreck with lots of life, including lobster, tom-pot blennies, nudibranchs and cookoo wrasse. Weather permitting, we’ll show you how to dive for Scallops, how to spot Nudibranchs and snoop out the elusive but beautiful Conga Eels. Accommodation and breakfast IS INCLUDED in the price and will be at The Royal Breakwater Hotel which is across the road from the launch site and does good food and beer in the evening and a hearty breakfast with free parking outside! So, two night’s accommodation (Fri & Sat) and two boat dives per day with the chance to log your first UK dives on some of the best shallow wrecks on the south coast! What are you waiting for? Grab your fins and come on down! Cost of diving £105 for 2 days. You need to arrange your own accommodation and then all you need is beer and evening meal money and fills. A £75 deposit is required to book a place on the trip. Cancellation Policy: £75 deposit refunded only if place filled. Full payment, is required 4 weeks before the weekend, non-refundable unless a replacement is found.